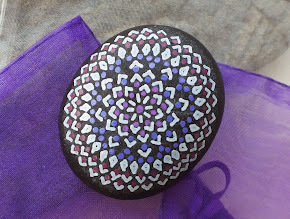 Alchemy Stones: Alchemy Stones and Metaphysics: "Chakra Stones"
Alchemy Stones and Metaphysics: "Chakra Stones"
A dear friend of the family is a big fan of Alchemy Stones, and recently suggested that we explore some different metaphysical angles with the stone designs. Specifically, he thought it would be interesting and cool if I could create sets of stones based around the seven chakra colors. I'm always up for a challenge. Although I am fairly familiar with chakras already, I needed to do some more research on the colors... and then figure out how to incorporate the colors while maintaining the "integrity" of Alchemy Stone designs. Truth be known, I wasn't too excited about the idea of just "drawing triangles on a rock," simply to meet a specific color scheme. Then the next challenge arose: Coming up with reasonably "matching" stones in groups of seven. NOT as easy as it sounds! 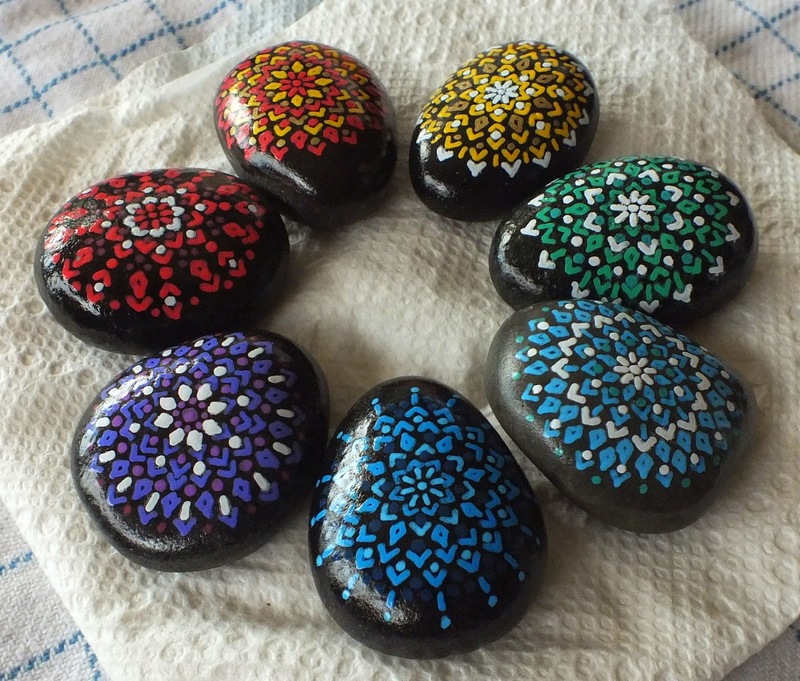 In fact, in going through the hundreds of beach combed stones at our house, I was only able to come up with two groups of stones that seemed like a "good set." Maybe I was being more particular than I needed to be, but it was important that the stones "feel right" together. The first set I made ended up becoming a present for our friend, who got married in our back yard labyrinth, a few days ago. The second set (pictured above) became Sarah's... but now I feel more confident in working with this concept... it's just a matter of finding nice "matching sets" to work with. At this point, I am only planning to offer Chakra Stones in matched sets of seven, although I may also make them available as individual stones matched to a particular chakra.